Employee Theft at the POS: What Are You Missing? Home > News > Blog > Theft at the POS: What is Your QSR Missing? Finding and keeping dedicated staff is one of the biggest challenges for fast casual and quick service restaurants (QSRs). According to the National Restaurant Association, the employee turnover rate in the restaurant sector was 72.9% in 2016, significantly higher than the average turnover rate for private sector workers of just over 46%. It’s hard to build trust with this level of churn in your workforce, and that’s something I believe contributes to another unfortunate problem for the food services industry: employee theft. Sadly, as much as 75% of all shrink in the restaurant sector is attributed to employee theft. While most restaurant workers are honest and would never think of stealing, it only takes a few bad apples to put a major dent in your profits. There are many different kinds of employee theft – stealing food, abusing discounts, or giving extras to friends and family – but in my experience, a lot of these cases can be traced back to the point-of-sale (POS). It’s the place where employees are trusted to handle transactions, but where some will manipulate the numbers for their own gain. Video surveillance is one effective tool you can use to investigate these crimes, but what if there was a way to actually detect a crime sooner, and stop it before it costs your business money? Experts agree that when it comes to employee theft, rapid detection is a business’s best defense against damaging losses. A recent study found that the highest losses occur when employees steal small amounts over a long period of time. In fact, it noted that nearly one-third (29%) of internal theft cases in the U.S went undetected for almost five years! Amounts can add up quickly over this period of time, so the sooner you pinpoint the theft, the better. By integrating your video surveillance with your POS data, and using the right kind of intelligent software application, you can dramatically reduce the amount of time it takes to uncover employee theft and protect your business from becoming another unfortunate statistic. Let’s take a closer look at some specific ways integrated video and POS data can help expose sticky fingers in the workplace. A common type of employee theft involves fraudulent refunds and voids. The employee issues fictitious refunds or voids a legitimate transaction and then pockets the money. Often this occurs when the individual is alone at the POS, or other employees are distracted. An intelligent software solution with integrated video/POS data can alert you to suspicious transactions on the day they occur. Because every POS transaction is captured on video, owners and managers can review suspicious looking voids and refunds to see exactly what happened. Is a customer standing at the POS? Or is an employee doing a void or refund after hours, all by themselves? Intelligent software can also be configured to look at the total number of voids and refunds each day, and each week, at each location (if you happen to operate multiple restaurants). This way, you can easily keep tabs on all unusual-looking transactions. Integrated video and POS data can help restaurant owners rapidly investigate suspicious transactions and uncover employee theft. Many restaurants offer their staff an employee discount for meals eaten at work, or to encourage food sales by employees outside of regular working hours. But some employees can abuse this privilege, either by giving unauthorized discounts to friends and family, or “extras” like free food and drinks to favorite customers. 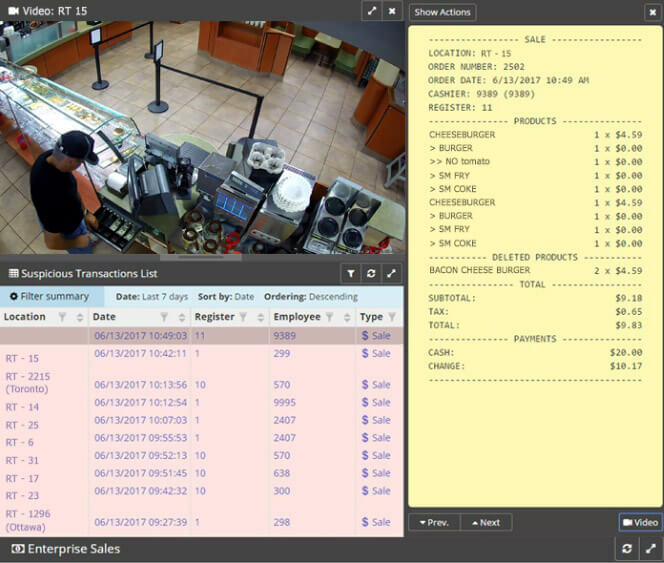 Integrated video/POS data can alert you to this type of activity because it records every discount, including which employee was at the POS, and what type of discount they entered. Because the software allows you to create customizable reports, you can easily review a list of every discount offered, including when and how many, and pull up the corresponding video surveillance. With this data, it’s very easy to see if a particular employee is entering an unusually high number of discounts. While food theft may not occur directly at the POS – often, this type of theft occurs after hours, with employees taking left-overs or other product out the back door – video and POS data can still help you uncover it. Because it tracks all of your sales, an intelligent video solution can help you more easily pinpoint inventory losses. By regularly comparing your sales to your physical inventory, you can gauge how long it takes to go through that case of French fries, and how many servings and sales it should generate. If the numbers don’t add up, just check the video to see what’s occurred. Even without POS data, video surveillance has proven to be very effective at revealing thievery. I heard of one business owner, who, out of curiosity, decided to review the video footage of the hour before his restaurant opened. He was stunned to see a crowd of people – all apparently friends of an employee – inside the business being given free food and drinks! Again, video delivers valuable information you would not otherwise have access to, enabling you to put a stop to this type of behavior. Video reveals information restaurant owners and managers may not typically have access to. Theft in any form costs you money so make sure you have the proper systems in place to monitor all areas of your business. As we’ve seen, video surveillance integrated with POS data can be extremely effective at helping to identify theft, but it’s also a good tool for revealing waste and other inefficiencies that ultimately eat in to your profits. This is especially true if you manage multiple restaurants, and you can’t be on-site on a regularly basis. The right kind of video system lets you quickly monitor each location on a daily basis, and also keep tabs on sales numbers, transaction anomalies and more. Very informative. I will add with such rapid turnover lots of time because improper training. One of best features of any video system is the opportunity to influence employee behavior. Thanks for your comment, Kim. It’s true that video can help you save time by helping with effective employee training. Not only will it help you spot opportunities for improvement, but it can also be used for positive reinforcement of good behavior, too.